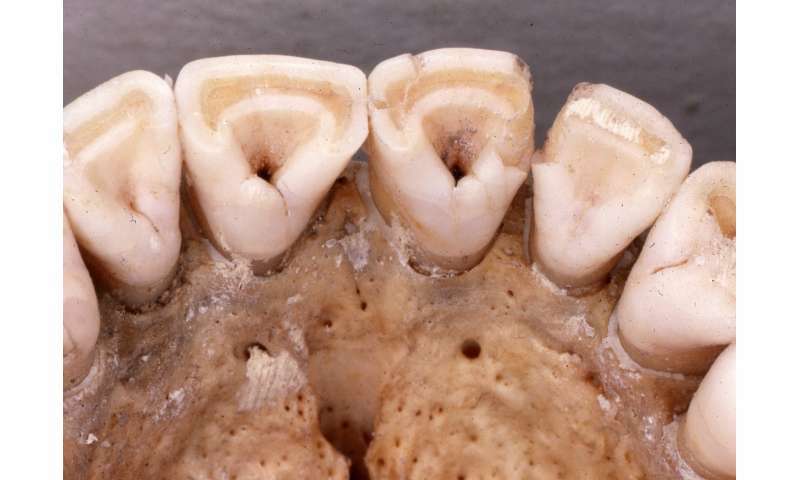 The critical role that breast feeding plays in infant survival may have led, during the last ice age, to a common genetic mutation in East Asians and Native Americans that also, surprisingly, affects the shape of their teeth. The genetic mutation, which probably arose 20,000 years ago, increases the branching density of mammary ducts in the breasts, potentially providing more fat and vitamin D to infants living in the far north where the scarcity of ultraviolet radiation makes it difficult to produce vitamin D in the skin. If the spread of this genetic mutation is, in fact, due to selection for increased mammary ductal branching, the adaptation would be the first evidence of selection on the human maternal-infant bond. "This highlights the importance of the mother-infant relationship and how essential it has been for human survival," said Leslea Hlusko, an associate professor of integrative biology at the University of California, Berkeley. As for the teeth, it just so happens that the gene controlling mammary duct growth also affects the shape of human incisors. Consequently, as the genetic mutation was selected for in an ancestral population living in the far north during the last Ice Age, shovel-shaped incisors became more frequent too. Shoveled incisors are common among Native Americans and northeastern Asian populations but rare in everyone else. Hlusko and her colleagues outline the many threads of evidence supporting the idea in an article published this week in the journal Proceedings of the National Academy of Sciences. The finding could also have implications for understanding the origins of dense breast tissue and its role in breast cancer. For the study, Hlusko and her colleagues assessed the occurrence of shovel-shaped incisors in archeological populations in order to estimate the time and place of evolutionary selection for the trait. They found that nearly 100 percent of Native Americans prior to European colonization had shoveled incisors, as do approximately 40 percent of East Asians today. The team then used the genetic effects that are shared with dental variation as a way to discern the evolutionary history of mammary glands because of their common developmental pathway. "People have long thought that this shoveling pattern is so strong that there must have been evolutionary selection favoring the trait, but why would there be such strong selection on the shape of your incisors?" Hlusko said. "When you have shared genetic effects across the body, selection for one trait will result in everything else going along for the ride." Getting enough vitamin D, which is essential for a robust immune system and proper fat regulation as well as for calcium absorption, is a big problem in northern latitudes because the sun is low on the horizon all year long and, above the Arctic Circle, doesn't shine at all for part of the year. While humans at lower latitudes can get nearly all the vitamin D they need through exposure of the skin to ultraviolet light, the scarce UV at high latitudes forced northern peoples like the Siberians and Inuit to get their vitamin D from animal fat, hunting large herbivores and sea mammals. But babies must get their vitamin D from mother's milk, and Hlusko posits that the increased mammary duct branching may have been a way of delivering more vitamin D and the fat that goes with it. Hlusko, who specializes in the evolution of teeth among animals, in particular primates and early humans, discovered these connections after being asked to participate in a scientific session on the dispersal of modern humans throughout the Americas at the February 2017 American Association for the Advancement of Science meeting. In preparing her talk on what teeth can tell us about the peopling of the New World, she pulled together the genetics of dental variation with the archaeological evidence to re-frame our understanding of selection on incisor shape. Incisors are called "shovel-shaped" when the tongue-side of the incisors - the cutting teeth in the front of the mouth, four on top, four on the bottom - have ridges along the sides and biting edge. It is distinctive of Native Americans and populations in East Asia - Korea, Japan and northern China - with an increasing incidence as you travel farther north. Unpersuaded by a previously proposed idea that shoveled incisors were selected for use softening animal hides, she looked at explanations unrelated to teeth. The genetic mutation responsible for shoveling - which occurs in at least one of the two copies, or alleles, of a gene called EDAR, which codes for a protein called the ectodysplasin A receptor - is also involved in determining the density of sweat glands in the skin, the thickness of hair shafts and ductal branching in mammary glands. Previous genetic analysis of living humans concluded that the mutation arose in northern China due to selection for more sweat glands or sebaceous glands during the last ice age. "Neither of those is a satisfying explanation," Hlusko said. "There are some really hot parts in the world, and if sweating was so sensitive to selective pressures, I can think of some places where we would have more likely seen selection on that genetic variation instead of in northern China during the Last Glacial Maximum." Clues came from a 2007 paper and later a 2015 study by Hlusko's coauthor Dennis O'Rourke, in which scientists deduced from the DNA of Native Americans that they split off from other Asian groups more than 25,000 years ago, even though they arrived in North American only 15,000 years ago. Their conclusion was that Native American ancestors settled for some 10,000 years in an area between Asia and North America before finally moving into the New World. This so-called Beringian standstill coincided with the height of the Last Glacial Maximum between 18,000 and 28,000 years ago. According to the Beringian standstill hypothesis, as the climate became drier and cooler as the Last Glacial Maximum began, people who had been living in Siberia moved into Beringia. Gigantic ice sheets to the east prohibited migration into North America. They couldn't migrate southwest because of a large expanse of a treeless and inhospitable tundra. The area where they found refuge was a biologically productive region thanks to the altered ocean currents associated with the last ice age, a landmass increased in size by to the lower sea levels. 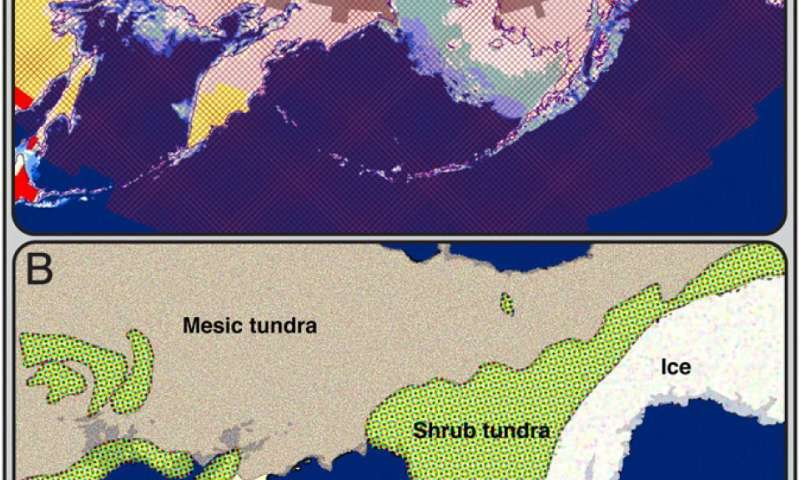 Genetic studies of animals and plants from the region suggest there was an isolated refugium in Beringia during that time, where species with locally adaptive traits arose. Such isolation is ripe for selection on genetic variants that make it easier for plants, animals and humans to survive. "If you take these data from the teeth to interpret the evolutionary history of this EDAR allele, you frame-shift the selective episode to the Beringian standstill population, and that gives you the environmental context," Hlusko said. "At that high latitude, these people would have been vitamin D deficient. We know they had a diet that was attempting to compensate for it from the archaeological record, and because there is evidence of selection in this population for specific alleles of the genes that influence fatty acid synthesis. But even more specifically, these genes modulate the fatty acid composition of breast milk. It looks like this mutation of the EDAR gene was also selected for in that ancestral population, and EDAR's effects on mammary glands is the most likely target of the selection." The EDAR gene influences the development of many structures derived from the ectoderm in the fetus, including tooth shape, sweat glands, sebaceous glands, mammary glands and hair. As a consequence, selection on one trait leads to coordinated evolution of the others. The late evolutionary biologist and author Steven Jay Gould referred to such byproducts of evolution as spandrels. "This Beringian population is one example of what has happened thousands of times, over millions of years: Human populations form, exist for a little while and then disperse to form new populations, mixing with other groups of people, all of them leaving traces on modern human variation today," Hlusko said. "An important take-home message is that human variation today reflects this dynamic process of ephemeral populations, rather than the traditional concept of geographic races with distinct differences between them."